I've been on a bit of a lobster roll (pun intended) lately because really, what's not to like with juicy, sweet "meat" pulled fresh from its shell and dipped in warm, drawn butter? The only thing better is a getting the freshest lobster at a great price. I thought the Enterprise Fish Company's $39.50 special I had last month was a good deal, but that was before I learned that the largest lobster festival in the world (according to the Guinness Book of World Records in 2009) is held right here in San Pedro, with an entire meal coming in at $20. 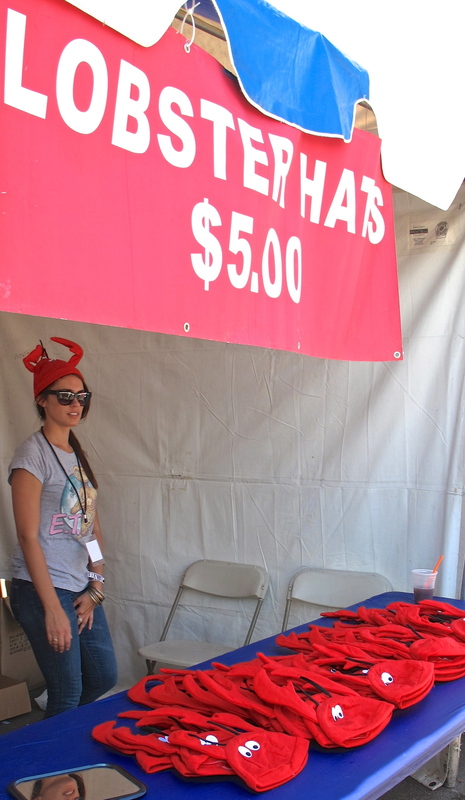 Lobsterfest takes place each year on the waterfront in San Pedro. There is a $10 admission so you can decide whether to add that to the total cost of your lobster. 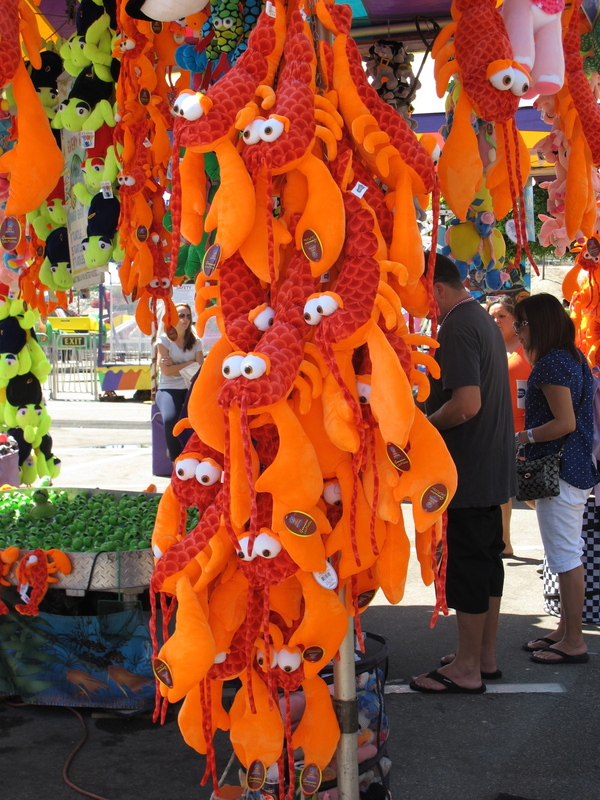 This is a festival though with carnival rides and games, but lobsters are the main attraction. You can win yourself a stuffed lobster buy shooting hoops, knocking over those impossible weighted mild crates, or shooting water to blow up a balloon. If that's all too much, you can simply buy a lobster for your head, as many did, to get in the lobster mood, but as the announcer said, "It's a bad day to be a lobster." There were even pirates walking around on stilts attempting to take pictures with children, but if you look at the bottom of this photo, past the pirates knees, you can just make out the kids. Long lenses were necessary. KROQ had a good musical line up on a stage near the water, which was nice background for lobster eating, and Bud drinking - the beverage of choice at the festival. Most were here for the crustaceans. The stats this year were pretty impressive. When you're ready to taste the bright red crustaceans, you go through a well run, fast moving line along a large tent. First stop is to get a tray with your pound and a quarter lobster with well-spiced, roasted potatoes, not well spiced, generic single serve coleslaw, a giant sweet bread roll and a tub of warm, melted butter to dip all of the above in. You can then take your lobster to another table for some swift knife cracking to your lobster to make it an easy eat experience, and that it was. Grab a shaded picnic table near the band and enjoy some ocean breezes and your fresh Maine lobster. While the lobster was a bit overcooked as almost always is the case for these events or even in many restaurants, it was still sweet and succulent, and really anything dipped in butter can be salvaged. It looks like 4 Guinness Book of World Records will be broken this year, so I'm sure you'll find the Port of Los Angeles Lobsterfest back again next September.